In Chemical Control: Regulation of Incapacitating Chemical Agent Weapons, Riot Control Agents and their Means of Delivery, Dr Michael Crowley makes a compelling argument that ambiguities surrounding riot-control and incapacitating chemical agents as well as their means of delivery present a threat to both human and international security. Within this book, published under the Palgrave Macmillan Global Issues Series, he lays out practical steps which could be taken by governments and civil society in this area. What is most striking about this book is the way in which intellectual rigour and tenacity is combined with the practical insights of someone with significant experience of human rights advocacy. This is reflected in the holistic and problem driven approach adopted within the book. Crowley lays out a very accessible formulation of the scope and challenge of the less-lethal chemical weapon issue. He points to the need for a web of preventative measures, embedded in a wide range of existing governance systems. 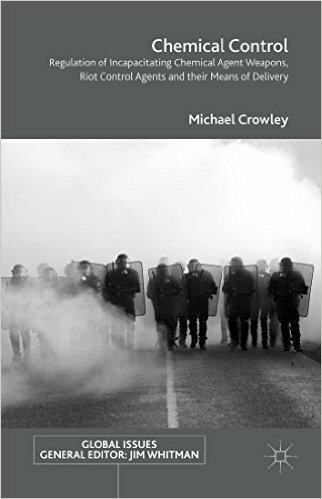 Following his introduction, Crowley devotes a chapter to characterising riot-control agents, incapacitating agents and delivery systems. In relation to riot-control agents he documents a range of human rights abuses committed through the inappropriate use of these agents by states, non-state actors and private security companies. Likewise, he also outlines a range of concerns raised by continued state investment into the development, stockpiling and use of incapacitant chemical weapons. Using publicly available information, Crowley identifies several states which appear to have acquired, developed or used incapacitant weapons since the Chemical Weapon Convention came into force in 1993. He notes that serious ambiguities exist within this treaty, in relation to how such weapons can be employed by states. He argues state inaction on this issue could contribute to the emergence of an increasingly permissive environment. This would result in further human rights abuses, and undermine the global chemical weapon prohibition norm. Crowley also examines state and private investment into riot control agent delivery systems. In particular, he outlines how ‘wide-area’ delivery systems currently on the market, such as large-calibre artillery munitions, cluster munitions and rocket propelled grenades appear to be intrinsically inappropriate for use as part of law enforcement. In each of the substantive chapters he meticulously examines the relevance of specific areas of international law. This includes arms control agreements, human rights law, international criminal law as well as narcotic drug control conventions. In the final analytical chapter Crowley also focuses on the role of civil society in developing and maintaining ethical standards in this issue area. The pragmatic and authoritative approach adopted within this work means that this book will undoubtedly become a reference work for policy shapers and academics for years to come. And, yet, it also struck me that the work held a much broader appeal. Although tailored specifically to the issue of less-lethal chemical agents Crowley’s holistic critical approach is potentially transposable to a range of issue areas; not least autonomous weaponry. Moreover, his humble reporting of the impacts of his own work, along with colleagues at the University of Bradford, should serve to encourage others seeking to change as well as map the regimes they study. Reviewed by Dr Brett Edwards, Department of Politics, Languages and International Studies, University of Bath. The book can be purchased via the website of the publisher.